Walnuts? Almonds? Or cashew? What’s your favorite kind of nuts? Do you know that they belong to the most healthy kinds of food? Just a handful of nuts covers daily dose of many important minerals. On the other hand, they’re very caloric so you’d better be a moderate eater in order to stay in shape. Learn more about the wholesome effects of nuts on your organism and get inspired by our original recipe. pistachio – contribute to hormonal stability (vitamin B6), protect eyesight (lutein). Try it without salt and sugar! In case you want to do something for your health, buy nuts in a natural form. Salty and greasy roasted peanuts or almonds covered with sweet chocolate can’t bring anything good. You don’t have to eat nuts as such. Try to prepare nut butter and the whole family will love it. The preparation is very easy, you just need to have the right juicer. Sana EUJ-707 is one of the best choices. Pull out the sieve and replace it with the blank screen. 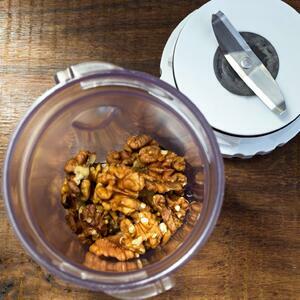 Slowly feed your juicer with nuts. You get almost ready butter in the container. Stir it a little and if you like more creamy consistency add a little oil.